Despite a somewhat uneventful 2014 in the sport, the one golden talent which served as a silver-lining with platinum potential was Omaha, Nebraska’s Terrance Crawford. Coming into the year few knew his name. By the time it ended, few could forget it! 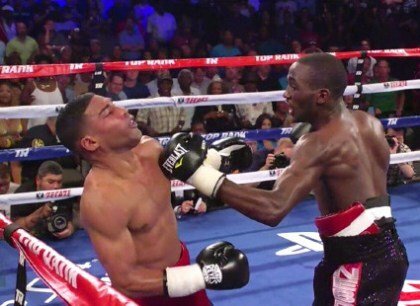 The emergence of Terence Crawford onto the scene has been a breath of fresh air. In what was once considered a limited selection of fans, suddenly, the African American base around the world has a talent to root for that does more fighting than flaunting (money), and more taming than talking! In less than 12months, Crawford took out Scotland’s Ricky Burns, Cuba’s Yuriorkis Gamboa, and Mexico’s Raymundo Beltran. If asked what his record would be at the end of such a run towards the end of 2013, more than half would have responded in saying that he’d finish 1-2; the others would have detested the notion that he would even take such a string of fights. Now that the damage is done, one can only wonder what it means for 2015. It has been confirmed that Crawford plans to move up in weight this coming year, which is a very interesting move considering the current landscape. As solid as he has appeared and as fundamental as he has proven, how does he handle the punch of a jr. welterweight? Does his silky smooth style allow him to take a hit from one? Each of these questions raised will be questions answered. We know the rulers of this division have something to prove. Are they ready for what Crawford has already proven? 2015 will tell us…. For Bernard Hopkins, 2014 served a great dose of reality. In one breath it showed that he can still win at the mid-level of the sport (Shumenov fight); yet in another it showed that his days atop the treacherous Light Heavyweight landscape are now over (Kovalev). For years, Hopkins said he “refuses to be one of those men” who abuses his body, fighting for money with very little shot at victory. Sadly, for the first time ever, we Kovalev showed us that not only has he hit the great wall (old age), but his meter appears to have run out of time. 2015 remains a huge question for most in the sport. For Hopkins, it won’t be about questions….it’ll instead serve as the proverbial ‘answer’, as once and for all, the finish line is defined. Careful matchmaking has played a role in his extended tour of the sport. Unfortunately for him, there’s no way to be careful at the highest level. Or is there? Vultures have been known to scan the landscape and locate that rare deficiency that even the eye of nature can miss. As we look at today’s crop of LHW champions, is there anyone who fits the bill? Or will one more young lion find the formula to crush his will? The only certainty with Hopkins is that hit or miss, 2015 is it! If you’re a fan, enjoy the moment. If you’re not, relish in it. But no question….the B-train stops here! At only age 28, seems Julio Cesar Chavez Jr. has been around forever. 51 pro fights and only one defeat, yet only a precious few names on his resume provide credibility to a career that has been anything but stellar. Rumor has it that his contract dispute with manager Bob Arum is soon to end, and his union with Al Haymon is set to take off. This is where 2015 gets interesting for Mexico’s biggest name! Carl Froch, Andre Ward, potentially GGG….each of these men and a few more fall on the shortlist of opponents for 2015. Unfortunately for Chavez, this can be viewed as bittersweet. Sweet in the sense that a pending detachment from Bob Arum will open the doors to greater fortunes. Bitter in the sense that there’s no where to hide amongst this level of talent. For Chavez Jr., 2015 will be very telling. Those critics who have often attacked him for having such a “padded record” will now see him against men who have every intent to expose that very thing. It’s hard to envision this being his final year in the sport, but it’s easy to predict it as being one of his more challenging. Will he win at all in 2015? Before he can answer that question, he’ll have to win his pending legal battle with Arum. Certainly no easy task. Lets see how it all unfolds. 2015 for Carl Froch should be a very interesting year. At age 37, he’s not getting any younger, yet the victories he posted against George Groves in 2014 explicitly proved to us how it’s very feasible that he’ll be around for a tad bit longer. Few his age possess the ‘bite’ evident in his gutsy performances over Groves, one in which many questioned whether or not he’d even walk away with the victory. Despite his ability, recent interviews suggest that the end could be near for the old cagey veteran. Which is why all eyes are now on Froch. He has stated that he wants to “go out with a bang”, so it’ll be quite intriguing to see which talents in the sport he chooses to collide with in what could be his final swan song? Does he land a Ward rematch? Does Chavez Jr. enter the equation? Will Hopkins’ eagerness to land something big play a role? Each of these options and more are on the table for Froch as he prepares to lay it all on the line. His recent ring encounters tell us that he’s more than capable of giving each of those men a tough night. Age and reality tell us that it could all go drastically bad when he least expects it. 2015 should be the end of the road for Froch. Whether he goes out with a bang, or falls victim to the boom remains to be seen. Stay tuned. 2014 was a rather interesting year for Matthysse. So much so, that it’s still a bit difficult to assess what it really means for his future. After suffering defeat at the hands of Danny Garcia in September of 2013, he rebounded with a gutsy performance over John Molina that saw him touch the deck twice. Many felt he lost the battle, apparently suffering from mental hangover effects from the Garcia loss! He would follow that effort with a victory over Roberto Ortiz. Solid performance, but definitely not the level of competition that will tell us whether or not he is who we felt he is. 2015 will answer that question, as the big-guns in the division are lined up to face him! Adrien Broner has been very vocal about calling him out, while quite a few others have also made their intentions to get him in the ring known. That reality tells us that 2015 will be a very telling year for Lucas. Has he totally recovered from the Garcia loss? Similar to Miguel Cotto, his level of opposition in the aftermath of his most recent losses don’t quite give us the answer. What we do know is that he’ll be ready to answer the call when the bell rings. What we don’t know is whether or not he’ll answer the final bell once it does! Should be interesting to find out! Few fighters in the sport took a bigger demotion in the court of public opinion than Peter Quillin in 2014. Not too long ago, he was viewed as a very dangerous fighter on the rise with a ceiling perceived to be very high. Sadly, a string of shaky performances and the decision to walk away from the largest purse guarantee in the history of his career has left him on every fans hit list! How does he bounce back in 2015? Does he finally test himself at the highest level by facing the likes of Korobov and Golovkin? Or does he continue to use political angles to earn good money in the midst of bad choices? These two questions will make or break him in 2015. In a patented “what have you done for me lately?” sport, every fighter is only as good as their last decision. If a fight with GGG or some other credible opponent is made within the first half of the year, all will be forgotten once the bell rings. If he fails to face a reputable talent, we could very well see him continue to spiral downward in the minds of those who once paid to see him. Haymon is now the chief navigator of his talent. Both will have to be very wise about protecting the very fragile image of Quillin. By Spring of this year, we should know. 2015 for Quillin is very simple: He’ll either rebound or touch the ground! 2014 saw much of the same as we’ve always seen from Erislandy Lara. Flashes of amazing talent at times, yet a failure very opportune moments at the wrong time. A year ago, many felt Saul ‘Canelo’ Alvarez would find a way to avoid such a challenge, instead looking for opportunities that present better pay with lesser risk. To the shock of many, he took on the challenge most felt he would fail to overcome. In what was a somewhat uneventful fight, Lara had ‘Canelo’ secured in the jaws of defeat….or so it would seem. Sadly, when the final bell rang, reality made the most noise! Similar to his performance against Paul Williams, Lara failed to seal the deal by doing more moving than fighting, and more talking, than walking (his opponent down). Although some fans felt he did enough to get the nod, again, the judges begged to differ. Lara has proven to have a talent on the highest level, but 2015’s test will all come down to how well he responds to the task of overcoming those who also fall on that list. Not sure what Santa brought Lara for Christmas, but fans can only hope this New Year brings him a killer instinct to match his dangerous talent. This will be his hurdle to jump in 2015. For now we watch and wait. Later, we’ll either ‘hate’, or hopefully ‘appreciate’. Stay tuned. (Vivek “Vito” Wallace can be reached at 754.307.7747. He can also be reached on Tuesday night’s live broadcast of “Left-Hook Lounge Radio”, Instagram (ViveksView), Twitter (@lefthooklounge1), and Facebook).